The Whales of Guerrero facilitates community-driven conservation in the fishing village of Barra de Potosí, pioneering a new approach to coastal protection that cultivates local leadership through citizen science, peer learning, and community outreach. After five years of collaborative marine mammal research, the seeds of stewardship have taken root in our region. We want to help them bear fruit by galvanizing an emerging group of Fishery and Conservation Leaders who will lead the development of a Marine Management and Protection Plan. A thriving Barra de Potosí that serves as a model for community-driven marine conservation and responsible ecotourism. Transform the relationship between people and nature through programs that inspire and empower. Organize a first-ever learning exchange to Baja California, to identify the steps they must take to save their local sea. Facilitate quarterly meetings with the FCL’s, as well as other local fishermen, tourism guides and thought leaders to begin developing a Marine Management and Protection Plan (MMPP). 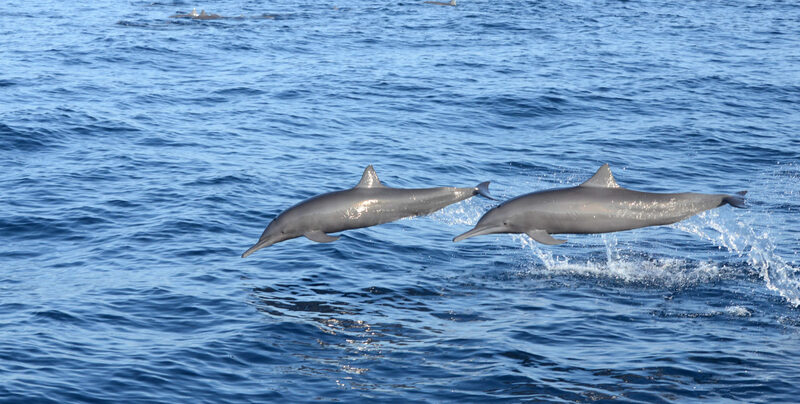 Wrap up a groundbreaking 1,600-hour whale and dolphin field survey, capturing footage of endangered newborn Central American humpback whale calves, little-known rough toothed dolphins and more with a 50/50 citizen scientist/biologist team. Awaken a love for nature in 2000+ local students and introduce them to the wild dolphins, whales and other incredible animals that are their neighbors through presentations and field research opportunities. Integrate our science, capacity building and school programs into business, government and educational entities so that scientific research, guide training, and hands-on science education will be supported locally for generations. Support the village in documenting their story and sharing it with their immediate, extended and global community through short documentaries and presentations in person and online. A VERY SPECIAL NATURAL REGION OF MEXICO NEEDS PROTECTION NOW. Protecting Endangered Whales Calls Focus to the Area as a Place Worth Saving. Bahia de Petatlan, Laguna Potosi and the small fishing village of Barra de Potosi are facing accelerated environmental degradation. The fisheries throughout Guerrero are in a state of collapse. Runoff pollution is bleaching our corals and making our wildlife sick. Climate change is causing more frequent, violent storms every year and affecting the temperature and acidity of the ocean. In recent years, FONATUR, (Fondo National de Turismo), the Mexican national trust fund for tourist development approached cruise ship lines with an offer for a pier to be built in front of the estuary fed by Bahia de Potosi. Fortunately, the proposal was eventually abandoned, mostly likely due to financial challenges and pressure from the local community. Not only does the open water host a population of migrating whales and countless species of fish, bird and sea life, but a 450-acre estuary surrounds the 600-person fishing village located at the end of the beach. A local group of concerned citizens is in the final stages of seeking Natural Protected Area status for this important ecosystem to remove the threat of future development. A scientific study of the wintering humpback whale population will greatly enhance the status of the application and could tip the scales in favor of protection. In recent years, the fish population appears to have declined, mostly likely due to an increase in commercial gillnet fishing and climate change. Local fishermen are growing desperate. Many resort to harvesting endangered turtle eggs and selling them as a means of survival. Creating a viable whale watching tourist operation could help to alleviate this financial pressure. We will have a clearer understanding of the local humpback whale population size and movement patterns through daily data collection and fluke identification shots. Our work will be a valuable contribution to the Fluke Identification Catalog and give us information through potential matches to whales in the Banderas Bay Area as to the movement patterns of this and possibly other stocks of whales. A census of the visiting whale population will be valuable data that can be added to petitions in progress by local environmental organizations to create a protected sanctuary of the region. We will have established working partnerships and communication between respected whale watch companies along the entire Western Pacific Coast. We will design and build websites and brochures about whale watching in the Bahia de Potosi with whale watch information, facts about humpback whales and safe whale watching guidelines. The brochures will be printed and disseminated throughout the Ixtapa/Zihuatanejo area. Six workshops led by local, national and international leaders in whale conservation and identification will have been conducted among the local and visitor populations, leading to an increased awareness about the whale population and safe whale watching practices. A sustainable, responsible whale watch company will have been started in the area, giving local fishermen extra means to support themselves and their families. We will have an established path for new guides to follow for the following year’s census and whale watch trips. Plans are in place to bring American students to Mexico to participate in whale and Bay conservation and conduct and cultural exchange. An increase in awareness about the presence of whales in the area will encourage ecotourism in the area. After visits from teachers in the U.S. and Mexico plans will be in progress to bring recent high school graduates to the area in coming years to participate in whale studies and conservation, encouraging them to become citizen scientists and naturalists. Upon completion of this project, we will have created a working prototype to apply to other small developing nation villages with consistent whale populations and underemployed fishermen.